Well Adobe’s Creative Cloud announcement has certainly had a reaction! There are a lot of photographer’s being understandably vocal about the changes. Are Adobe listening? Er, yes, they can’t miss it! In a dpreview interview, Winston Hendrickson (VP of Creative Solutions) said “[we know there’s] currently there’s not a lot of photography-specific value in our subscription products”. 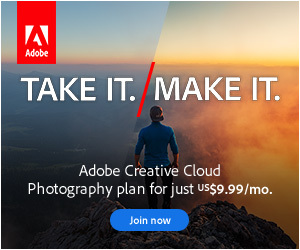 Adobe clearly knows that they have a LOT of work to do to win back photographers. But to be honest, that could be the best result possible for us as users. I’m hearing a lot of people saying “I’m taking my business elsewhere” or “I’m looking for alternative software”, but the reality is, you won’t hurt Adobe by shooting yourself in the foot. Your current software has been working, and will continue to do so. You’ve already paid for it, and you know how to use it. Lightroom meets most of our needs as photographers, so if you don’t like the changes, hold fire and stick with CS6 for the moment. Adobe have promised to continue supporting CS6 for the next Windows/Mac operating systems, and make ACR8 available for CS6 with new camera support and Lightroom 5’s Edit in Photoshop compatibility. So even if you don’t like the idea of subscription, there’s no rush to jump out of the frying pan and into the fire. These changes have just completely opened up the playing field. Other developers are going to jump on it and make the most of it. Some will do well and some will fail. I would suggest that now’s not the time to be making reactive decisions about your future photography software. Adobe are no longer the only game in town, and they’re going to have to work really hard to make their software great value, if they want to get photographers on board again in the future. That’s a great thing for us as users. And if they don’t do it, then we’ll be in a far better position to see which developers ARE then meeting our needs. The playing field will change significantly over the next year or two, so it makes far more sense to take a deep breath, sit tight and see who comes out in front. There’s been some confusion over whether Lightroom’s going subscription-only in the future. In the dpreview interview, Bryan O’Neill Hughes (Photoshop Senior Product Manager) said “We don’t have plans to make Lightroom a subscription-only option but we do envision added functionality for CC members using Lightroom.” Yikes, what did he mean by that?! There hasn’t been an official announcement on that yet, but logic would suggest he was referring iPad/tablet/cloud facilities that Tom previewed on The Grid last week, which of course would require some kind of cloud subscription, otherwise it wouldn’t work! That doesn’t mean the Lightroom perpetual license software is about to be dumbed down or hobbled. EDIT – I’ve just had confirmation that Bryan’s comment was a mistake and there won’t be a different CC version of Lightroom. The future iPad/tablet/cloud facilities might not even be linked to Creative Cloud. The software you already own has been working just fine, and Lightroom 5’s looking like a great perpetual license upgrade, so there’s no reason to throw our toys out of the pram and look elsewhere yet. They’ve heard the reaction. Let’s hang tight and see what Adobe does next before making any decisions. In the long run LR will be part of the cloud as well. Adobe wants our money. Better look out for alternatives. Alternatives will most likely come from other companies who want money as well, so in the end there’s little difference. The difference is between squeezing out the customer and using your monopoly and offering a product at a fair price. You may be right about it being a subscription sometime in the future Egal, but even if it does, it’s much cheaper than Photoshop, so any future subscription would be very affordable. I wouldn’t suggest worrying trying to cross that bridge until we come to it. If it does ever happen, you’ll have plenty of time to compare alternatives at that stage. At that point I will be even more locked-in into the Adobe world with even more pictures edited in a way only Adobe software can use. So better change to a company who is not famous for using its monopoly to rip off its customers. I will check out Capture One Pro in the following months. That’s your prerogative Egal, and I wouldn’t fight you on that, if that’s what you want to do. I think it’s a shame though, because Lightroom is getting better and better. I can only repeat that they really do see their ‘consumer’ products as a completely different business class to their ‘creative professionals’ products. I’ve just been on a webinar where that’s been reconfirmed. You are right Victoria, so far LR is the best program available but we are acting against our own interest if we fuel Adobe with even more money to strenghen its monopoly. The Macromedia case should have warned all of us earlier. I understand where you’re coming from, but I think we’re probably only hurting ourselves by doing that. Creative Pros who use more Adobe software provide most of Adobe’s Creative Division profits. Much as I hate to admit it, I think photographers are a comparatively small chunk of their income. If that’s true, then the monopoly is likely to continue with or without us, as those Creative Pros don’t seem overly upset about the new deal. Like many I’m a long term adobe user and not happy with their escalation in prices in the last decade topped off with the sour tasting rental model. I’ve always bought the master collection which was supposed to be everything Adobe in a box -Then LR comes out and that’s extra which sucked and still does. Then I buy MC6 and what do you know – suddenly edge n fuse come out and are also not in the box. A few months later CC comes out and Indesign CC (I’ve bought ID since V1.5) has features not in CS6 – ipad dev features. Anyone doing any kind of publishing is now publishing for the iPad or is history. Nasty. I feel so suckered even if my CC monthly ransom is temporarily at a discount. With the imperious release of CC I’m now on the look out for Adobe’s competitors – Aperture in this conversation comes to mind. At £54 quid a pop it’s chump change AND it’s a pretty damn good alternative. And it makes me wonder… Apple look like they might be seeing a new revenue stream here: Logic pro X and final cut pro come to mind. Are Apple turning their mighty abilities to flesh out a pro design suite that’s print and web balanced at their usual low prices? Adobe would be sunk overnight as Apple never release anything but solid software. I speak to many other designers (been a designer for 35 years, I know a few people) and no one I’ve spoken to in the last 3 years is lovin’ the adobe brand. Yeah, it’s a tough call. Technology continues to move quickly and their move to the subscription model is supposed to allow them to stay ahead of the game, but it’s a risky move. They’re laying all their bets on the Creative Cloud, and it could still go either way. They certainly have to rebuild a lot of lost trust. But they create great software, so it’s worth giving them chance to prove themselves IMHO. For those that do not upgrade every version, this plan is NOT good value. There are many that want the full PS features, but do not need the latest versions. For the corporate world and pros it is ok, but for the enthusiast it is not a good plan at all (except for Adobe). Yeah, I understand that Don. That’s why they’ve kept CS6 available and updated, for those enthusiasts – and other users – who can’t or don’t want cloud subscription. And by the time that’s no longer an option, the whole world of computing may have changed. I no longer trust what Adobe have to say. I shall continue to use LR4 for the short-term but I shall not be investing another dime with them. I do understand you’re upset Lobo. What is it specifically that has made you lose trust? The fact that they’ve decided to go subscription-only and you don’t like that idea, or something that they’ve done wrong in communicating, or…? If the memory was better than it is I would be able to remember what it was that initially made me distrust Adobe. I’ve been in software development for so long they must have done something long ago…… Anyway the handling of this subscription debacle is just the crowning glory. Like nearly everyone else, I like to own the stuff I use and am prepared to pay for it. That said, despite having licenses for LR2, 3 and 4, I have never been that enamoured with the product. The fact that the future decisions surrounding LR are a complete unknown does not inspire confidence or trust. With me, that trust, once lost, is invariably lost forever. I shall continue to use LR for what it currently stores and the TTG plugins in which I have invested but not a dime more will I invest in Adobe. Thanks for helping me with that Lobo. Hopefully one day they’ll get the chance to redeem themselves. It’s not simply a matter of how affordable any proposed “photographer-specific” versions of CC may or may not be – it’s a matter of losing access to the software if (when?) you are no longer able to afford the monthly subscription. I shall be retiring in a couple of years & I have been planning it for a while. My plans included putting aside the money so that when this day comes, I will be able to purchase the best computer I can at that time as well as the latest versions of all the main software I use, because it’s going to have to last me some time. On a reduced income I wont be able to save money for upgrades the same way I can now. I most certainly did not plan to add yet another monthly outgoing, especially one that will cost me more than upgrading every other version. What about professionals whose business takes a dip ? What about companies whose finances will be adversely affected (not necessarily because of increased cost but because of the way they account for different types of spending)? What about the fact that as a result of these changes, someone can pay Adobe a small fortune over a period of years yet as soon as they are unable to pay, they end up with NOTHING. *sigh* I am inclined to agree with you that we should all take a deep breath and wait – with fingers crossed – for Adobe to do something to address these issues. But I am not optimistic and I will not, ever, pay for a subscription to software and risk losing it all if the day comes I can no longer budget for it. That’s a concern that’s being heard from a lot of people Gill, so it’s definitely on their radar. Let’s wait and see what happens. We’ve got plenty of time using CS6 before we have to make any decisions. Hi Victoria, one other question has just occurred to me and I hope you might know the answer. I have a boxed copy of CS4 but downloaded the upgrade to CS5. If the worst was to happen and I lost not only my Mac but also my backups, would I still be able to download CS6? Or can I still purchase the CD from Adobe? They’re not still selling CD/DVDs, but I think you should be able to download purchased items from within your Adobe account. In fact, it’s probably worth doing that now and burning it to DVD yourself, just for your own peace of mind. Worst case scenario, I’m sure you could probably borrow an installer DVD from someone, as long as your license number was still available. There is an issue, if CS6 is an upgrade you need to have an earkier version on your HD. Unless you want to pay full price. I’m going to do Photoshop CC, but not the other products. But it does feel like going to buy a car, and the salesman says “we don’t ‘sell’ cars anymore, we only ‘lease’ them.” You’ll always have a newer model car, but you’ll ALWAYS have a monthly payment. That’s a good compromise Jared. Yeah, I know it’s not everyone’s cup of tea. I’m not generally a fan of renting either, although I’d make an exception for things I use all the time. Adobe’s stock figures will be interesting to watch. The market’s sure to get nervous with all this chaos going on, but whether it’ll hit Adobe’s profits, I’m not so sure. Bryan Hughes’ comment only makes it worse. I completely agree Stan – particularly as it was WRONG! I’ve had confirmation (and updated the blog post) that there isn’t going to be a different CC version of Lightroom. The time that CS6 will be fully supported by Adobe is the time we have to explore other options to Photoshop. If you believe that Adobe will not make Lightroom CC only in the future when they are looking to squeeze more blood out of this turnip, we could focus on asking for more features and plugins that are still Photoshop only. We should also look into virtual machine technology to see if we can take old software installs and get them working long after the original publishers refuse to activate ancient licenses on re-installs. Yeah, there’s no rush to do anything Marcos. Lightroom’s offering more of what we need with every release, and with the more tools they add to LR, the less we need pixel editors. The majority of photographers barely scratched the surface of Photoshop. This change may get more people buying Elements, which could expand its development budget so it includes more of the Photoshop features we use, so we could even gain out of this change. Here’s an idea Adobe may want to consider. After a certain period of CC membership, allow one to drop out and keep the current release of one or more products (the number of products could be tied to the length of membership). This would protect more casual users, people who retire, those that have a financial setback, etc. while professionals who upgrade regularly anyway would just stick with the CC. Yeah, that’s one of the possibilities I’ve suggested too. It would certainly be my preferred option. I now have CS5 and was not thinking of CS6. Do I need to upgrade to CS6 to have a perpetual license? Will I lose my CS5 capability if I don’t upgrade? Thx. Hi Fritz, no, your perpetual license will carry on for as long as you have a computer that will run it, don’t worry. Yeah, I’ve heard the rumblings. A lot of that sounds like standard legalese. I bet a lot of it’s in the old agreements too. I believe the date of birth has to do with COPPA (Children’s Online Privacy Protection Act) but they’re looking into alternative ways of complying. The right to terminate is understandably worrying – I’ve questioned by Kindle books because of similar terms – but unless they find out someone’s using it to plot terrorist attacks or something like that, how likely are they to do that? Nevertheless, they’ll be well aware of the outcry. We can only speculate what the real motivation for forcing subscription is. Photoshop is however quite a mature product and if traditional perpetual upgrades become hard to sell because of limited new features, then forcing a subscription model would be worth the attempt. Gaps have been filled also by plug ins, which in many cases were more creative and faster to market then the frame-work product itself. But in reality the stills world is without major innovation in the top end all around. We still have no high end revolutionary image capturing device and we hold on to “film SLR emulators” making the mirror flap around like mad to keep up with the potential of the electronics. Intel has not brought out any new major desktop CPUs, generation 2 i-cores from 2011supporting up to 64Gb or RAM are still ranking as the best in case of very large images with PS. Windows 8 has a different feel and additional features, but pure core performance is reported to be not any different to Win 7 x64. So to me nothing exciting from the big companies, one feeds the other. I’m afraid that PS CS6 as a perpetual license will not be supported for long, there will be simply no funds to do so. Over the last years we had an explosion of semi professionals, but perhaps it seems some realize now, that the latest and greatest alone does not make money to pay for it all. Photoshop, just like desk top computers have become less relevant to many, and PS might return to the purely professional status it once had before the digital revolution. What goes up must come down. Taking our business elsewhere doesn’t mean we are going to cease using our current software today … to use other options … It only means, that for me, at least … I’ll NEVER spend another cent on Adobe “creative apps … ever. I’ll simply continue to use what I have, and when a competing developer steps up to the plate with a viable option, I’ll make that decision at that time … there’s no shooting oneself in the foot going on at all … The days of “You must use Adobe software or you will fail” are over … and IMHO … long overdue. I’ve already moved my entire RAW workflow away from Lr to Aperture because Adobe simply will not offer viable slideshow and book options … if I have to use outside options to complete two-thirds of my workflow … it wasn’t all that difficult to remove the remaining third … to my surprise, Aperture may be long in the tooth, and considered inferior … if I do the best job I can before I trip the shutter release … I really don’t need all that much help from ANY RAW converter … so I won’t ever be upgrading Lr … sad though … if Adobe had paid any reasonable attention to slideshow and books in Lr, I would have never even considered Aperture. In the end … I’d rather fail and end up in bankruptcy court using iPhoto or Picasa on my own terms, than to be enslaved with monthly payments to Adobe from here to eternity.